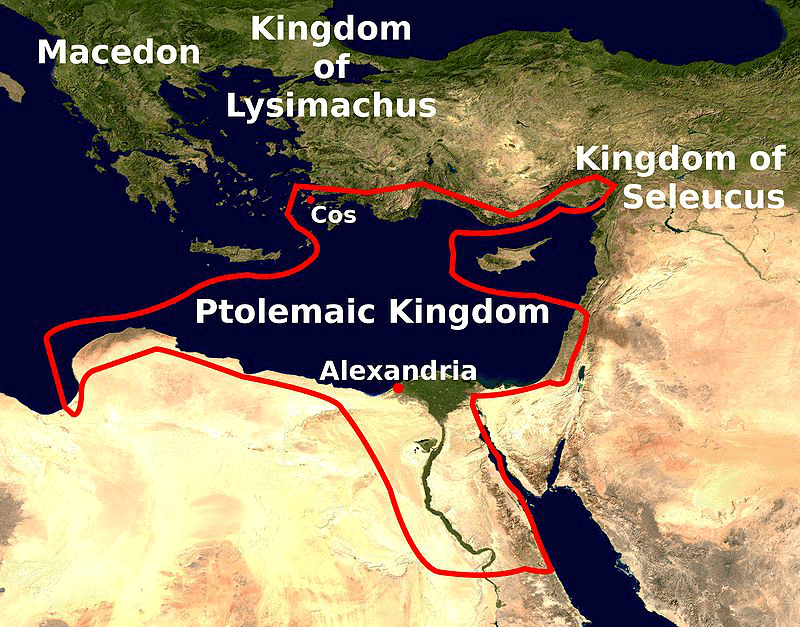 The Ptolemaic Kingdom was a Hellenistic kingdom based in Egypt. It was ruled by the Ptolemaic dynasty which started with Ptolemy I Soter's accession after the death of Alexander the Great in 323 BC and which ended with the death of Cleopatra VII and the Roman conquest in 30 BC. To gain recognition by the native Egyptian populace, they named themselves the successors to the Pharaohs. The later Ptolemies took on Egyptian traditions by marrying their siblings, had themselves portrayed on public monuments in Egyptian style and dress, and participated in Egyptian religious life. The Ptolemies had to fight native rebellions and were involved in foreign and civil wars that led to the decline of the kingdom and its final annexation by Rome. Hellenistic culture continued to thrive in Egypt throughout the Roman and Byzantine periods until the Muslim conquest. Reverse: ΠΤΩΛΕΜΑΙΟΥ ΒΑΣΙΛΕΩΣ Eagle standing left on thunderbolt; cornucopiae left, ΔΙ between legs. Ref: Svoronos 1125; SNG Copenhagen 199.